Light freckles are scattered across the bridge of her nose and cheeks, and she has her legs tucked tightly into her body. Despite Naomi’s friendly openness as she retells her formidable journey, her body language still illustrates the desire to keep who she is to herself. Cookson first began training Muay Thai in Thailand nearly 8 years ago. After living in various parts of the world, she wanted to spend time with her mother who was living in the country, so she set off. An athlete for her entire life, Naomi decided to put aside triathlons and started to learn Thai Boxing. She began her training at the National Stadium where she learned Muay Boran (the ancient, more form-based style of the sport), and at age 26 switched to training with another well-known Nak Muay, Anne Lieberman, at Jitti Gym. A contrast to American academies, Naomi was not given much direction in the Thai gym and it took some time for her to really understand how to throw a proper kick or punch. Motivated by her newfound training partner and soon-to-be best friend, she attended consistently for several months, sometimes training up to three hours a day. After gaining admission to a grad school in New York, Cookson left Thailand for the States. There, she was once again reunited with Lieberman at Kru Natalie Fuz’s academy, Chok Sabai. “Anne is a big part of my journey with Muay Thai,” Naomi says with a smile. As she speaks, Lieberman is downstairs holding pads for a beginner student. Her voice carries up to us and we can hear her give technical advice. Less than a year into her training and having only been at Chok Sabai for about six months, Cookson went into her first fight. She had fun and thoroughly enjoyed the experience, but with fighting came the resurgence of an eating disorder. Cookson had previously been able to manage it–somewhat–but becoming a fighter made it nearly uncontrollable. “It was just the whole cycle of it all. You had to diet and cut weight for your fight. Once your fight was over, you had that ‘release’, where you want to just eat everything. It was binge-eating and restricting over and over again. That left me with a really unhealthy mindset. I just coped by keeping myself in fight camp all the time. Cookson decided to put fighting to the side as she figured out what it was that she wanted. She realized that the emphasis on weight was what had been making her miserable–not the sport itself. Going to a new gym also helped Cookson clarify how she wanted to train. Training at Physical Culture Collective gave Cookson a new role in the sport of Muay Thai–that of a coach. With PCC being open for almost two years, Cookson and the other coaches are training more fighters. Despite the fact that coaching is mentally exhausting, they are well known for complete devotion to their students. True to her coaching style, Cookson has also been able to break herself down and rebuild who she is as a fighter. 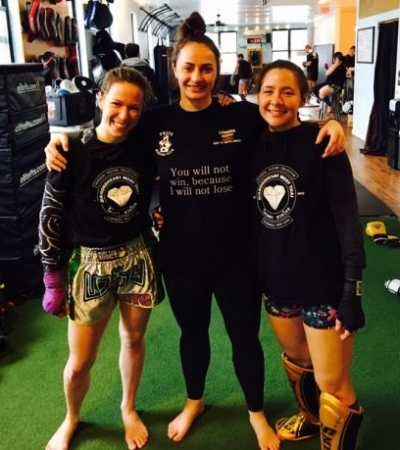 She credits K-1 and MMA fighter Daria Albers for helping her through much of her struggle as well as helping her to learn more about the sport. “I had one idea of what I thought Muay Thai was, especially NY Muay Thai–but there’s this whole other world out there: globally, nationally, regionally. She helped me to realize just how big the world of Muay Thai was and that it wasn’t just this bubble I thought it was. She’s had a great impact on my life as a mentor and a friend. The way that Cookson was able to navigate through the distress and pain of an eating disorder was by deciding to be true to herself and her body. She trains and fights in a way that is most comfortable for her, including wearing a shirt while she fights–foregoing the usual fight attire of a sports bra and Thai shorts. Coach Daria has witnessed much of Naomi’s growth and considers her to be a very dear, close friend. The two of them have developed a very deep bond that is reflected in both their friendship and their coaching. Cookson sees Albers as her mentor and appreciates the feedback she is given as a coach and a fighter. Naomi reflects that she and Daria, “talk a lot about the big picture. How do you teach someone to have fun when they’re sparring, instead of just teaching the techniques? I ask her for advice all the time. We watch fights and look out for what’s happening mentally with the fighters, emotionally how things are playing in the ring. She would ask me, ‘How would you coach this fighter?’ and puts it all in perspective for me. It’s important to keep an eye out for their emotions and fear. Sometimes emotion is more important than technique in the ring. If you’re an emotional disaster, you can have the best technique in the world but won’t be able to execute anything. How do you make sure when your fighter gets to the ring, how do you make sure they’re where they need to be, mentally, emotionally, and physically? That’s what we find to be most important than speed or strength. As the world of combat sports, particularly Muay Thai, continues to develop, Cookson is excited to see its growth. 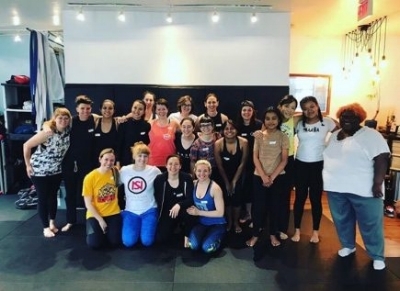 When she’s not fighting or coaching, Naomi is working with Anne and friends Karen Miller and Margaux Genoff on self-defense seminars for women. With 7 fights in the last 7 years, Cookson finds most of her energy going towards being more of a coach than a fighter. “What the students can trust about me, is that I take them, their goals, and the sport very seriously. I help them really focus when they’re on the mats. I will be there for you 100% and help you get there. I’m very honest and will let them know the truth. Honesty is really important for your training–you need to know how you’re training accurately for your growth as an athlete and a person. With her path behind her, it seems as though Cookson has made a road not just for herself, but for other women to follow in her footsteps.